In a series of three posts we share feedback from other senior-level marketers on why marketing automation is needed, benefits of marketing automation, and highlight their lessons learned from using marketing automation. This post covers the benefits of marketing automation. 1. The number one benefit of marketing automation is better leads/more robust pipeline. Marketing automation improves the quality of leads handed to sales, increases opportunity to pipeline conversion, and accelerates a prospects time to revenue. As discussed, lead scoring delivers better leads to sales. In addition to lead scoring, marketing automation provides lead nurturing to build relationships with new leads and your existing database. Businesses will increase opportunities and lower cost per lead resulting in higher margins and a “fatter” forecast. 2. Almost half of participants agreed that marketing automation provides better customer insight/data. Lead tracking helps sales and marketers identify what a prospect is truly interested in by logging pages viewed, search terms used, time on site, emails opened, and more. It’s like turning your website into a sales person. Sales can easily identify when a prospect is thinking about your solutions and what they care about, allowing sales to optimize their “pitch”. We welcome your feedback, comments and suggestions. 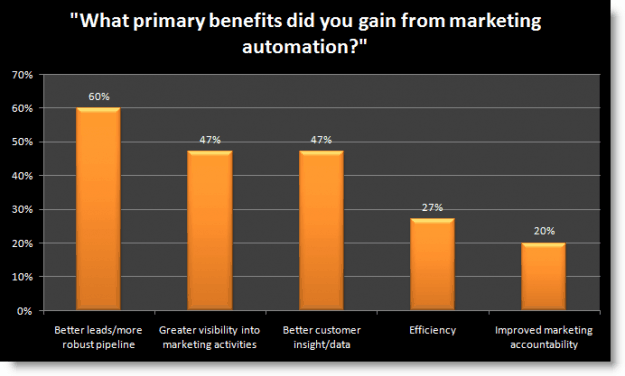 How have you benefited from marketing automation? To be alerted of future posts, please click on the RSS button. Feel free to read part one, need for marketing automation, and part three, lessons learned from marketing automation.